Matteo Manassero (born 19 April 1993) is an Italian professional golfer who plays on the European Tour. He is the youngest golfer to win a European Tour event. Manassero was born in Negrar, in the Province of Verona. After a short period at the Villafranca Golf Club, Manassero learned the game at the Gardagolf Country Club in Soiano del Lago following the lessons of the club pro Franco Maestroni. Manassero is currently the touring pro of Gardagolf. In 2009, at the age of 16, he became the youngest ever winner of the British Amateur Championship, defeating England's Sam Hutsby in the final. The win qualified him for the 2009 Open Championship, where, playing alongside Tom Watson and Sergio García in the first two rounds, he made the cut and won the Silver Medal as leading amateur. He eventually finished tied for 13th place. 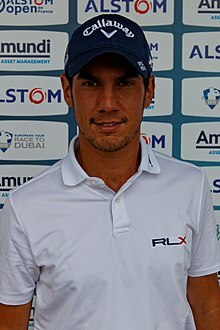 Manassero topped the World Amateur Golf Rankings on 30 December 2009 and remained number 1 for 18 weeks, until he was removed from the rankings upon turning professional. On 9 April 2010, Manassero beat Bobby Cole's record, which lasted since 1967, to become the youngest player ever to make the cut at the Masters Tournament, at 16 years and 11 months and 22 days. Manassero was nearly two years younger than Cole was when he made the cut at the 1967 Masters. He was surpassed by Guan Tianlang who, on 12 April 2013, became the youngest player to make the cut in PGA Tour history at 14 years, 5 months of age. Manassero announced that he would turn professional shortly after the Masters and about two weeks after his 17th birthday. Manassero turned pro on 3 May 2010, making his professional debut at the BMW Italian Open. His first win came on 24 October 2010 at the Castelló Masters Costa Azahar in Valencia, Spain, where he triumphed by four strokes over Ignacio Garrido. The victory made him the youngest ever winner on the European Tour, surpassing the record set by Danny Lee at the 2009 Johnnie Walker Classic. The victory also secured his full European Tour playing privileges for the next two seasons. Manassero posted another very strong result when he tied for second in the 2010 UBS Hong Kong Open, one stroke behind winner Ian Poulter. He won the Sir Henry Cotton Rookie of the Year in 2010. In 2011 Manassero secured his second European Tour win at the Maybank Malaysian Open on 17 April 2011 at the age of 17 years and 363 days, making him first and second on the list of youngest European Tour winners. In 2012 he managed to further improve his results: in November 2012, after a win at the Barclays Singapore Open, he became the first teenager to win three times on the European Tour. He also collected a second place at the Open de Andalucía Costa del Sol, and five more top 10 placements that earned him the 13th place in the final Order of Merit. In 2013, Manassero won the biggest tournament of his career to date: the 2013 BMW PGA Championship with a birdie at the fourth extra hole of a playoff against Simon Khan and Marc Warren, becoming the youngest ever winner of this tournament. With the win Manassero gained the right to play in the 2013 U.S. Open and entered the top 30 of the Official World Golf Ranking. He also managed to further improve his final Order of Merit position with an 11th place. After collecting a 4th place at the 2014 Aberdeen Asset Management Scottish Open as the sole top 10 result of the season, 2015 proved to be a more difficult year for Manassero in the European Tour, where he was able to make only 6 cuts in 22 competitions. He finished 167th in the final Order of Merit, but was able to retain his tour membership in virtue of the win at the 2013 BMW PGA Championship. After the first round of the 2016 Scottish Open, Manassero opened up to bunkered magazine about "deep lows" he had suffered during his period of struggle. He went on to finish T3 at Castle Stuart, his best result on the European Tour all season. ^ "Matteo Manassero". Federazione Italiana Golf. Retrieved 20 July 2009. ^ "Manassero claims British amateur". BBC Sport. 20 June 2009. Retrieved 20 July 2009. ^ Murray, Ewan (19 July 2009). "Matteo Manassero returns to school before chasing professional dream". London: The Guardian. Retrieved 20 July 2009. ^ "14-year-old Guan Tianlang of China makes cut at Masters". WFTV TV. Archived from the original on 16 April 2013. Retrieved 12 April 2013. ^ "Italy's Manassero, 16, says he's turning professional". pgatour.com. 10 April 2010. Retrieved 10 April 2010. ^ "Matteo Manassero becomes youngest European Tour winner". BBC Sport. 24 October 2010. Retrieved 2010-10-24. ^ Inglis, Martin (8 July 2016). "Matteo Manassero back from 'deep lows'". bunkered. ^ "What's in the Bag: Weekley, Manassero, Lee". 28 May 2013. Retrieved 12 June 2013.